If rubbish removal is on your to-do list, turn this tiresome chore over to JDog Junk Removal Capital Region. We’re your source in Schenectady and beyond for garbage removal made easy. Whatever unwanted items you’re looking to unload, our professional junk hauling team can be there soon to take it off your hands. Best of all, when you hire us for junk removal services, you’re working with an American-owned and veteran-operated local business. So why not clean up your property while supporting our dedicated junk removal company at the same time? To find out more about our efficient and affordable junk hauling services, call or e-mail us today for a free estimate!  Whether you’re doing a seasonal yard cleanup or you’re dealing with a major estate cleanout, JDog Junk Removal Capital Region has you covered. No job is ever too small or too big for our garbage removal crew to handle. We’re at your service regardless of the size or the nature of the junk pickup. Aside from hazardous waste, you can count on our rubbish removal experts to collect and cart off just about anything you ask us to. We even work with Veterans Miracle Center to repurpose and reuse as many items as possible, so less of the stuff you trash ends up in local landfills. When you add up all the time, gas, and elbow grease that goes into DIY junk hauling, it’s just not worth the trouble to try to take on this task alone. JDog Junk Removal Capital Region can help you tackle your junk pickup needs in next to no time. Plus, we’re proud to be one of the most affordable junk removal companies in the Schenectady metro. Not only do we bring you some of the lowest prices in town, but we give you a free price quote up front and we include the total junk removal cost in that no-charge estimate. That means we won’t come back and hit you with extra fees for TV recycling or latex paint removal. Our junk hauling customers trust us to deliver solid workmanship with honest pricing, and that’s what we’ve been doing since 2011. Don’t take up your free time lugging cumbersome junk to the dump. For old refrigerators, old bicycles, old computers, and more, just put in a call to the hardworking vets at JDog Junk Removal Capital Region. We’re a family-owned rubbish removal business, and we look forward to serving you or your company as well as we’ve served our country. Contact us today to make your appointment for fast, friendly, and affordable junk removal services. We’re here 24 hours a day to help you out! Even emergency calls are no problem for our Capital Area junk pickup pros. When you have an urgent situation on your hands, you can’t beat the punctuality and discipline of veterans. We’ll show you how it’s done with our speedy response to last-minute junk removal situations. Don’t delay. Now’s a great time to call!